Sometimes a telehealth program’s best feature is its ability to start a conversation. At St. Joseph’s Villa in Richmond, Va., a simple virtual visit platform has turned an eight-bed crisis stabilization center into an indispensable resource for families of children aged 5-17 who are struggling with depression and anxiety. The 32-inch television and audio-visual telemedicine feed enable these kids to talk to a child psychiatrist based in New Jersey, and to connect with counselors at any time during their voluntary 14-day stay. In the six years that the program has used telehealth, roughly 88 percent of those adolescent patients have gone back to their home or a less-restrictive facility, while 12 percent have gone to a hospital or similar institution. And about 16 percent have come back to the program. Officials say the program isn’t about medicine, but about compassion. Launched in 1834 by the Daughters of Charity, it’s the third oldest children’s program in the country, now offering a variety of programs for thousands of Virginia children and their families each year. The crisis shelter is one of those programs, offering a voluntary place to stay for those between the ages of 5 and 17 who are struggling with anxiety and depression, don’t qualify for hospitalization and can’t afford the thousands of dollars in co-pays for private services. Hedley says the program offers troubled adolescents a place to feel safe, and to talk to counselors about their issues. But those counselors are hard to locate, expensive to hire and can’t always be found when they’re needed the most. Seven years ago, armed with a 10-year state grant, St. Joseph’s installed a telemedicine station from InSight and connected with a child psychiatrist several states away. She handles most of the virtual visits during each patient’s two-week stay, while InSight provides 24/7 coverage when she isn’t available. Hedley says he saw the difference in how the crisis center’s resident reacted to the technology. The population served by St. Joseph’s Villa is growing at an alarming rate. The National Alliance on Mental Illness estimates that 20 percent of the nation’s teens are living with a mental health condition, and half of those diagnosed with a mental illness began to show symptoms by age 14. In addition, half of all teens diagnosed with a mental illness drop out of school, and three-quarters of teens now in juvenile justice programs are dealing with a mental health issue. And suicide now ranks as the third leading cause of death among those age 14-24. While the number of adolescents in distress is growing, the ranks of healthcare providers able to treat them are thinning. No state has an adequate supply of child psychologists, according to the American Academy of Child & Adolescent Psychiatry. And those who in the field are overworked, have waiting lists several months long and skew toward patients and programs that reimburse for their services. That, Hedley says, leaves a large chunk of middle class America lacking the resources they need to treat an adolescent in need of mental health care. Hedley says St. Joseph’s focuses on the social aspects of treatment rather than the medical aspects. Everyone coming into the program does so voluntarily, and with support from the family. St. Joseph’s then works with the family, community resources school officials and others to create a support network for these patients when they’re discharged. With a daily video link to specialists, he says, more of St. Joseph’s patients are prepared for what’s outside the program. They’ve had the opportunity to talk to someone who can bring them down off the cliff and into a more stable place, and they can talk in an environment that’s more comfortable for them, enabling them to open up more. “This is cutting edge,” Hedley says of the telehealth platform. Hedley expects the program, which received a telehealth innovation award in 2014 from the Mid-Atlantic Telehealth Resource Center, will continue well after the initial grant runs out. It will have proven its value, he says, in returning more children and adolescents with special needs to their families and their communities, rather than a hospital or institution. He also expects to add telehealth services to several programs run by St. Joseph’s Villa. “The ability to get these kids in front of people as quickly as we can is so important,” he says. September 16, 2016 – Mental health providers, including psychiatrists and therapists, are now available to offer psychiatric assessments, talk therapy and medication management through a newly launched behavioral health practice in New York called Inpathy. Inpathy is unique in that it operates entirely through telebehavioral health – a convenient, private and effective medium of care that is rapidly growing in popularity. ROCHESTER, NY | Psychiatry appointments from the comfort and convenience of home are now available to New York residents through the launch of a new telebehavioral health practice – Inpathy. 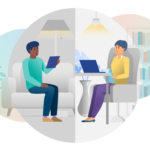 Telebehavioral health allows individuals to attend sessions with behavioral and mental health providers online through secure videoconferencing. Inpathy is a division of InSight Telepsychiatry, the largest telebehavioral health organization in the nation. Inpathy providers include adult and child and adolescent psychiatrists and psychiatric nurse practitioners that are available for psychiatric assessments, medication management and prescriptions when appropriate. Therapists and counselors are also available for talk therapy sessions through telehealth. Many of the Inpathy telebehavioral health providers offer night and weekend appointments, which can be accessed through the internet from home using a smartphone, tablet or a computer with a webcamera. This makes managing behavioral health care more convenient by eliminating the need to travel to in-person appointments and sit in waiting rooms. Another benefit of telebehavioral health is that it is a more private way to access behavioral health services, which makes it a good option for individuals who are worried about a stigma on behavioral or mental health care. Just like in an in-person office, the telebehavioral health providers who deliver services through Inpathy are fully supported by a clinical and administrative staff that handles their scheduling, billing, intake, general operations and clinical oversight. Inpathy accepts insurance from several major insurance companies, including Aetna. For in-network telebehavioral health sessions, individuals are only charged their co-pay just like they would be for an in-person session. Inpathy providers are also available for out-of-network and cash-pay appointments. Telehealth is a rapidly growing industry and more and more insurance companies and providers are offering this form of care. Numerous studies have shown telebehavioral health to be as effective as in-person behavioral health services in most situations. To get started as an individual using telebehavioral health care, individuals can visit http://www.inpathy.com to search the Inpathy provider directory, sign up, select an appropriate provider and schedule a session. Inpathy has a 24-hour technical support line and care navigation team that can be reached at 1.800.442.8938. InSight is also in the process of developing referral relationships with a number of New York organizations that could benefit from additional behavioral health services for their clients. To learn more about this or connect individuals you know to care, visit http://www.inpathy.com. April 19, 2016 | St. Joseph’s Villa of Richmond, Va. works with InSight Telepsychiatry to bring telepsychiatry services to their Crisis Stabilization Unit, an innovative program in a unique setting that diverts children in mental health crisis from unnecessary hospitalization. RICHMOND, Va. — St. Joseph’s Villa is collaborating with InSight Telepsychiatry to bring telepsychiatry to children receiving mental health services at their facility. St. Joseph’s Villa (SJV) provides children and their families with a variety of social services. One of SJV’s many innovative and effective programs is their Crisis Stabilization Unit (CSU), where children experiencing mental health crises can go to receive treatment in an environment that feels like home — all with the goal of preventing costly, unnecessary hospitalization. Since opening in 2012, the CSU has served nearly 500 children and has successfully diverted nearly 90 percent of them from hospitalization. InSight has helped the CSU work toward this goal for nearly two years. Located in a repurposed cottage with spacious bedrooms and recreation areas, SJV’s CSU’s six-bed facility acts as a hybrid between a residential home and a hospital. This hybrid model allows SJV to offer clinical services, including telepsychiatry, while giving children in crisis a less restrictive environment than that of traditional residential treatment centers. A first-of-its-kind facility in central Virginia, the CSU was a runner up in the Innovative Practices Award presented by the Council on Accreditation to spotlight organizations that bring lasting change to the lives of vulnerable individuals through unique, forward-thinking initiatives. Telepsychiatry allows children in the CSU to see psychiatry providers through videoconferencing. With the option to utilize remote providers, telepsychiatry and other telemedicine services represent unprecedented access to specialists who are typically difficult to staff in rural and underserved areas. When the CSU opened in partnership with the Richmond Behavioral Health Authority (RBHA) Region IV, SJV found that it was challenging to locate a qualified local child psychiatrist. In terms of mental health providers, several of the counties SJV’s CSU serves are Designated Health Professional Shortage Areas, according to the U.S. Health Resources and Services Administration.1 Ultimately, SJV turned to telepsychiatry as the solution for bringing psychiatric care to their facility. Telepsychiatry isn’t just a means of bringing access to care. The telepsychiatry medium is able to help these children express themselves better, says Craig Hedley, SJV’s Director of Community Partnerships. “Kids are used to Skyping, but they can be intimidated by adults. Children can relate to them better through a TV screen, which provides them a layer of safety and protection,” he says. The CSU collaborates with an InSight telepsychiatrist for about 15 hours a week of regularly scheduled services. The telepsychiatrist, Dr. Ashika Kapoor, helps onsite providers assess children’s symptoms and manage their medications. According to Hedley, Dr. Kapoor is a flexible asset to this team-oriented approach and goes out of her way to help the team help the children for which they care. The relationship between the InSight telepsychiatry provider and onsite staff is vital to the success of SJV’s CSU program. InSight Telepsychiatry is the leading national telepsychiatry service provider with a mission to increase access to appropriate behavioral health care. Telepsychiatry has been proven an effective and cost-conscious way to bring psychiatric care to children.2 Forty percent of InSight’s telepsychiatry providers are child and adolescent psychiatrists.